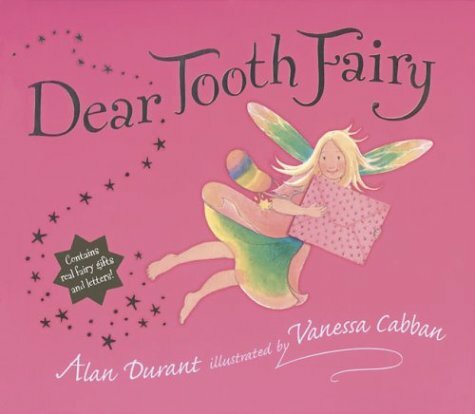 Whether you’re teaching your child how to brush or need to help your child be comfortable going to the dentist, these picture books about brushing teeth will do the trick! 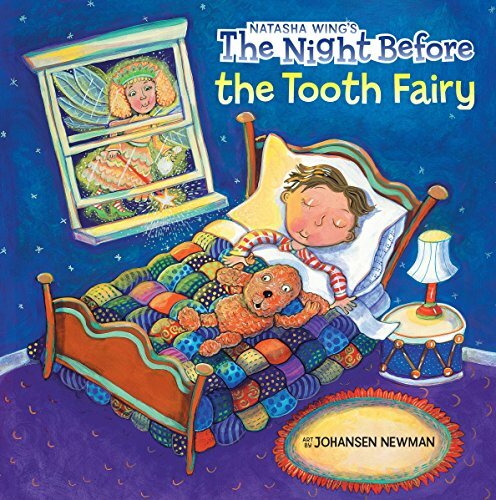 You can find these picture books about brushing teeth for kids at your local library or purchase through the affiliate links provided for your convenience. Developing good habits at an early age and scheduling regular dental visits helps children get a good start on a lifetime of healthy teeth and gums. Parents and children are encouraged to brush their teeth for two minutes, two times per day as a way of building good oral health. 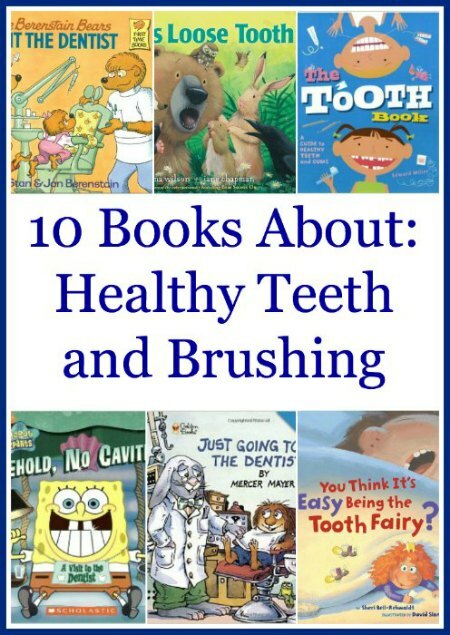 To get your children on their way to developing great teeth brushing habits, read these books about good oral hygiene and teeth with your kids and get the discussion going. 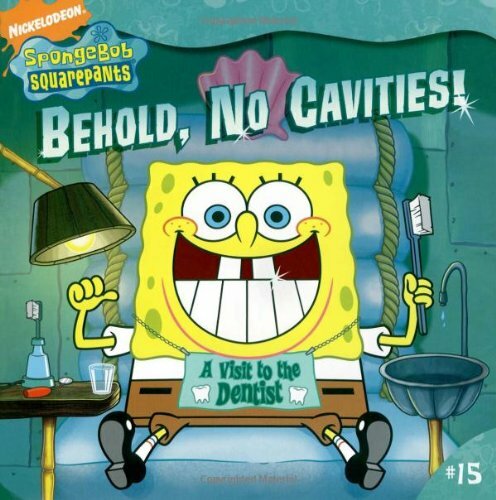 Behold, No Cavities (Nickelodeon – SpongeBob Squarepants): SpongeBob can’t wait for his six-month checkup at the dentist! That morning he discovers that not only has Patrick never gone to the dentist, but he’s never even brushed his teeth! SpongeBob calls his dentist and gets Patrick an appointment that same day. SpongeBob is expecting another cavity-free checkup and getting his name put up on the No Cavi-Tree again when he learns some horrifying news! Will Patrick’s name replace SpongeBob’s name on the No Cavi-Tree? Will SpongeBob ever be cavity-free again? Open Wide: Tooth School Inside: It’s time for tooth school and Dr. Flossman is excited to meet the incoming class of 32–eight incisors, four canines, eight premolars, and twelve molars, including the four wisdom teeth. There’s just so much to learn–from brushing and flossing to dentin and pulp to every student’s nightmare: tooth decay! 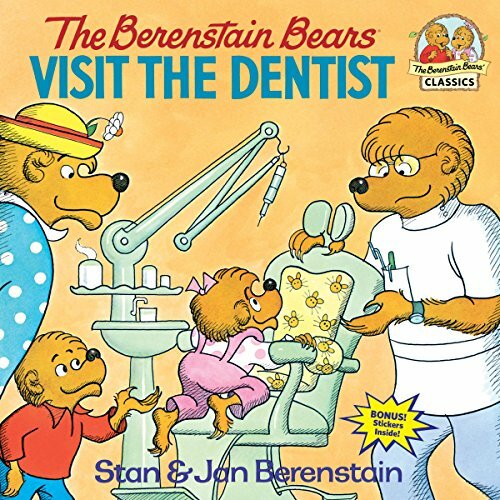 The Berenstain Bears Visit the Dentist: Sister Bear watches Dr. Bearson fill Brother Bear’s small cavity. Then it’s her turn in the chair to have a dangling baby tooth removed. An entertaining story for preschoolers of a cheerful and informative visit to a dentist. You Think It’s Easy Being the Tooth Fairy? All over America, kids are losing their teeth. And who is there to gather them up, leaving coins in their places? The Tooth Fairy, of course! 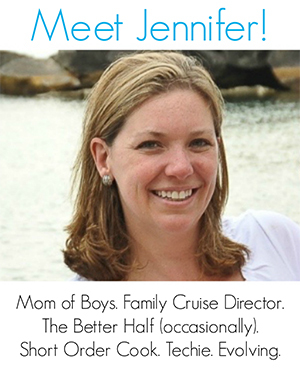 A self-described “action kind of gal” with plenty of attitude, she reveals her secrets at last. Learn about her amazing Tooth-o-Finder. Marvel at her ingenious flying machine. Watch her in action, dodging dogs and cats and gerbils. You Think It’s Easy Being the Tooth Fairy? 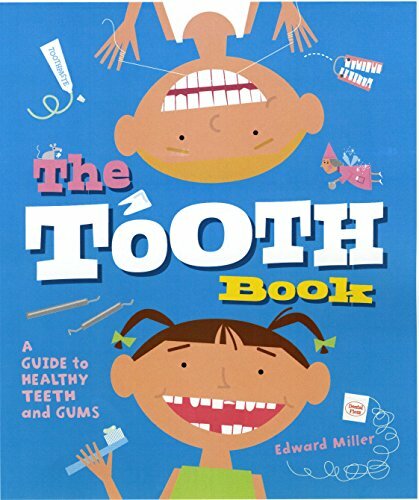 is the essential guide for every kid about to lose a tooth. The Tooth Book: A Guide to Healthy Teeth and Gums: What should you expect when you go to the dentist? What should you do if you lose a tooth? Full of straightforward advice and animated, colorful art, as well as some bite-sized bits of history and lore, this guide provides accessible information about taking care of your teeth. 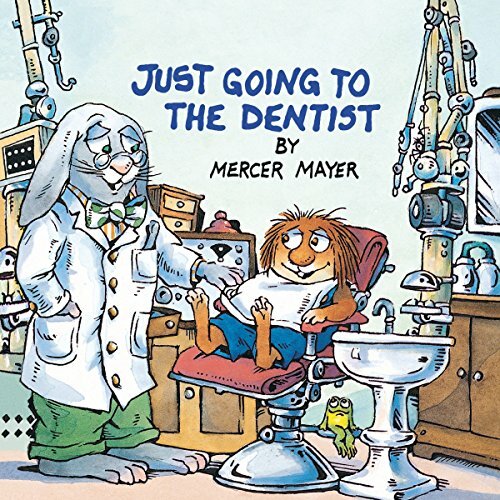 Just Going to the Dentist (Little Critter): Mercer Mayer’s very popular Little Critter is on his way to the dentist. It’s a thorough check-up, complete with dental x-rays. When Dr. Ghum insists on filling a cavity, Little Critter goes through it bravely. The visit is painless to the reader because of Little Critter’s funny, honest way of look at things — including the world of dentistry. 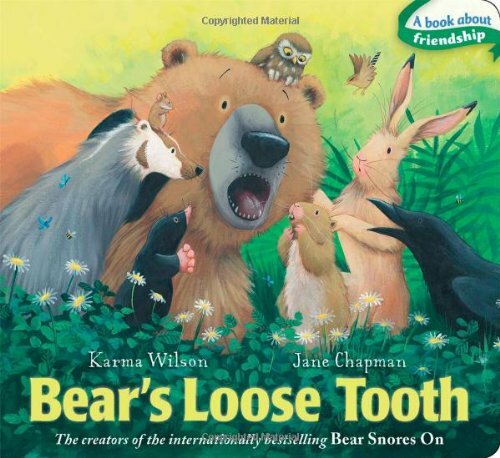 Bear’s Loose Tooth: Bear and his friends are munching on their lunch, when all of sudden… Bear feels something wiggling and wobbling in his mouth. Oh, no! What can it be? It’s Bear’s first loose tooth! Bear’s friends ease his concerns about his wiggly, wobbly tooth and help him understand losing a baby tooth is perfectly natural. This funny and reassuring story will delight anyone who’s ever had a loose tooth. The Night Before the Tooth Fairy: It wiggles, and waggles, and wiggles some more, but this little boy’s stubborn tooth just won’t come out! He hopes it will fall out soon, because he can’t wait to meet the Tooth Fairy! This humorous tale is based on Clement C. Moore’s classic poem. 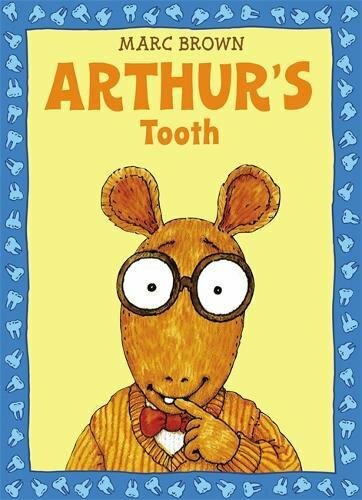 Arthur’s Tooth (Arthur Adventure Series): Arthur’s whole class has started losing their teeth-but not Arthur. His loose tooth wiggles but won’t come out. Everyone seems to think they have the best solution. But none of their ideas work! Will he be stuck with his tooth forever? Dear Tooth Fairy: Holly’s tooth has fallen out, but she’s not sure she wants to give it to the Tooth Fairy just yet. She has a few questions to ask first, about how fairies operate and where her tooth will end up. Luckily, the obliging Tooth Fairy responds- five times! Readers will be tickled to reach inside real envelopes and find Holly’s missives from the Tooth Fairy, including removable letters, a poster, a riddle-teller, and—finally—a shiny fairy coin. 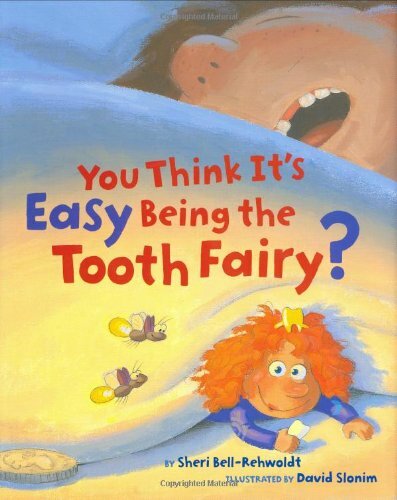 Like these picture books about brushing teeth? Find even more engaging book lists for kids with more than 100 book-themed reading lists!